Two journalists in Morocco - Driss Ksikes and Sanaa al-Aji - stand accused of defaming Islam and outraging public morals. The case refers to an article about religious jokes which appeared in their magazine, Nichane, and judges are soon to deliver their verdict. Courtroom number eight in the Casablanca High Court is an imposing place. Two portraits hang on the wood panelled walls above the seats reserved for the presiding judges. 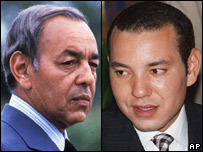 The pictures are of the King of Morocco, Mohammed VI and his now deceased father, Hassan II. The one of Mohammed, a shy but fairly genial young man, shows him smiling. The one of Hassan shows him frowning. The pictures tell the story of Morocco over the last half century. While the seven years of Mohammed VI's rule have seen modernisation, liberalisation and reform of the media, the days of King Hassan were ones of fear. They are known in Morocco as the "years of lead" - lead because of the heaviness in people's hearts, the lead of the darkness they saw around them and the lead of the bullets that shot them. King Hassan was not a man who tolerated dissent. Thousands of people disappeared in those days. Even today, very little is known about what really happened to them. They were simply airbrushed out of history. It is thought many of them died lonely deaths in secret prisons and interrogation centres. In the "years of lead" no one spoke out of turn and everyone had respect for their monarch... but not many people laughed. Humour and jokes were in short supply. But on Monday the judge did something incredible. He read out a joke about King Hassan. It went along the lines of: "Did you hear the one about the king, God and Heaven and Hell..."
The joke was written down by Sanaa al-Aji and edited by Driss Ksikes, but they did not invent the joke. It has been heard in streets and cafes up and down the country. This and other gags were the evidence presented against the two journalists in what is in effect a blasphemy trial. "What made you want to write this joke?" asked the examining judge. "Is nothing sacred? Do you not love your country?" In Morocco there are two things that are potentially risky to comment on: the king and religion. By telling jokes about both, the journalists are pushing the boundaries of their newly-won press freedom. If these jokes are already well known, is it not hypocritical to punish us for merely recording them? But once you let the genie of freedom of speech out of the bottle, it is impossible to put it back in. Morocco has come a long way since the time of Hassan II and the fact that these jokes are made at all suggests that society has changed irrevocably, whether the courts like it or not. 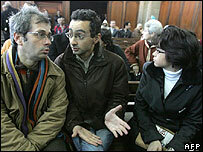 The editor and his reporter faced the panel of judges and told the court that laughter was permissible again in Morocco. To make jokes was not something to be ashamed of, they said. "People laugh and they go to pray," they continued, "there is no contradiction in that. There is a time to be serious and a time to have fun. "If these jokes are already well known, is it not hypocritical to punish us for merely recording them?" they asked. "We are journalists, we simply look at what goes on and try to understand ourselves better through what makes Moroccans laugh, but the jokes do not reflect our personal beliefs." Driss Ksikes said that laughter told us a lot about what made a society tick. It revealed its neuroses, its fears and its aspirations. Besides, he said, Morocco was a funny place. It was at this point that something changed in the atmosphere of the court room: grim looking security guards leaned forward with a glint in their eyes, the previously bored clerks looked up from their files, and the judge himself could not suppress his own laughter. The room suddenly seemed a lot lighter and less imposing. The journalists had let the laughter back in. But the prosecuting lawyer did not see the funny side. He curbed the laughter with a voice that boomed off the wooden walls and concrete ceiling. He reminded the court that there must be limits to freedom of speech, that some things are better left unsaid. In short, what was sacred should not appear in magazines. In the Koran it says there should be no image or personification of Allah. The jokes were doing just that, he said. He recommended prison sentences of five years, a £6,000 fine ($11,500) and for the journalists to be banned from their profession for life. So now the judges in particular and Morocco in general have a choice. And it is not an easy one. Do they side with liberal values and win the admiration of Western democracies, or do they uphold their Islamic traditions and receive the backing of most of the Arab world? But laughter, like freedom, the journalists said, could not be suppressed. If it was, that might take Morocco back to the "years of lead", to the days of the king who would not smile and his subjects who dared not laugh. From Our Own Correspondent was broadcast on Saturday, 13 January, 2007 at 1130 GMT on BBC Radio 4. Please check the programme schedules for World Service transmission times.